invisible, yet it makes its presence felt at all time. 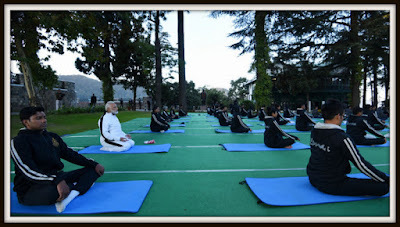 Modi on Friday addressed over 360 officer trainees of the 92nd Foundation Course at LBSNAA. The officer trainees belong to 17 civil services, and 3 services from the Royal Bhutan Civil Service. PM also said that the "sense of career," which had successfully brought the officers to LBSNAA, should now be replaced by a "sense of mission” i.e. to serve the people of India. He said that in future, when they serve in the field, this should be their "purpose of life”, according to a PMO statement quoting what PM said. PM Modi further urged the officer trainees to tour the field areas during their postings, adding that travel is a great Indian tradition, and travelling and interacting with people is a great learning experience. The address was preceded by presentations made by the officer trainees on essays written by them on the subject "Why I joined the Civil Services"; and on themes such as housing, education, integrated transport systems, malnutrition, solid waste management, skill development, digital transactions, Ek Bharat - Shreshtha Bharat, and New India - 2022. PM also said that the problem of silos and the lack of team spirit among civil servants can be effectively tackled during the initial training at Mussoorie. Earlier in the morning, PM participated in the Yoga session of the officer trainees, with the Himalayas in the backdrop. Non-IAS officers file a petition to Prime Minister Narendra Modi alleging bias (http://www.financialexpress.com/india-news/non-ias-officers-file-a-petition-to-prime-minister-narendra-modi-alleging-bias/507714/). There is a clear BIAS and everyone in the Central Civil Service and two other AIS services can feel and see it. The Indian Armed Forces officer personnel also know this as well. It is time that all IAS officers in the Central Government be shunted back to their cadre states. Let IAS officers suffer in the heat and sweat, to know, how Indian average person suffers in 3rd world country, called India. It is time for you, O respected Sir, to give up your own bias against IAS!